Why did LED Skin Care Spa choose Micro Channeling instead of older technologies from the past? Micro Channeling is…. 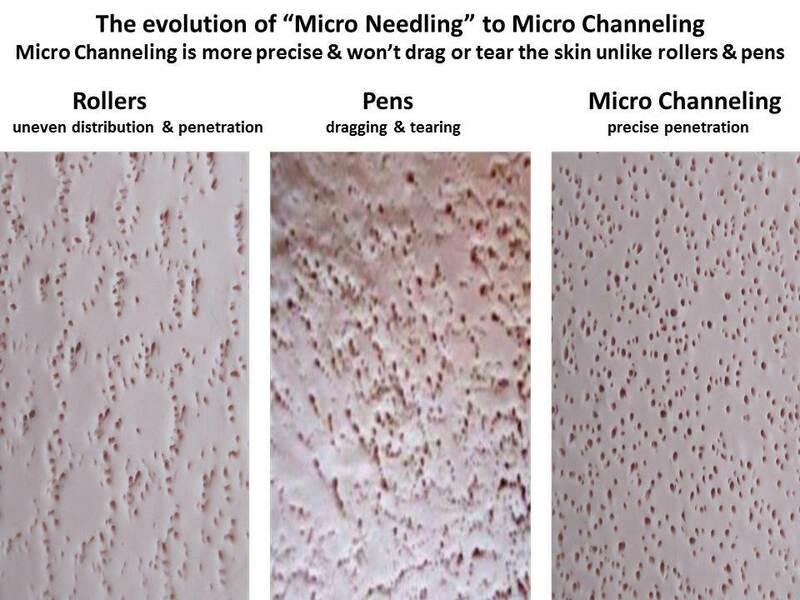 Why choose Micro Channeling over Laser or Aggressive Chemical Peels? Micro Channeling works by making tiny punctures on the surface of the skin. These small wounds (much like a deep scrape – deeper IS NOT better) trigger a healing response of new collagen, elastin and blood flow. Your end result is thicker skin (skin thins as we age) plumper, smoother and a brighter, firmer, healthy completion. How often and how many treatments should you have will be determined by how much damage needs to be addressed like wrinkles, scaring, pore size, skin discoloration and age. Treatments can be performed every 4 – 6 weeks. > Maintenance is every 12 weeks to continue skin remodeling and collagen production. After your treatment, plan to relax and give your body a healing chance. The body heals when we sleep and are not stressed. Defend yourself against pesky bugs by drinking Harmonized Water (HW) that uses frequencies to keep the bugs away! Take one hour before being exposed to the outdoors to keep the mosquitos away with frequencies vibrating at your skin level mosquitos find annoying. Occasionally a determined mosquito gets through the vibrations so be sure to drink mosquito HW every 3 hours you are exposed. No odor, side effects or chemicals you are protected from head to toe! Follow steps 1 thru 5 listed above and you can Order “Mosquito” HW Here!